If you own a home, you’ll probably need to engage in some landscape design at some point. Landscape design is a vast and varied practice, that ranges from the very simple to the incredibly complex. Of course, not many of us have undertaken studies in landscaping, so we are very much beginners and novices when it comes to decorating our front and backyards. If you want to save some money, or you just like doing things yourself, there are plenty of easy tips to employ during the landscape design process. All good projects have two things – a plan and a budget. Formulating a plan is all about research. The best part of creating a landscaping plan is that it’s a lot of fun. Pick up some magazines, scroll through your favourite Instagram pages or even go on a jaunt through your neighbourhood for inspiration. Once you are inspired, you need to figure out how much each aspect will cost, which is how you create a budget. If that final budget is within your financial means, it’s time to start enacting that plan. Colour: If you’re going to opt for a monochromatic scheme, this will need to be followed in both the plants and the materials – white roses with sandstone pavers. You can also create contrasts by placing red roses around bluestone pavers for example. If you’re going for contrast, be wary of choosing too many colours – a busy backyard can be a little stressful on the eye. Height: When it comes to height, it’s all about working with the space you have. Some plants can grow very high in a short amount of time, which isn’t a good idea if you’re working with limited space. You also need to think about the plants below tall plants – will they have access to sun and water? Texture: Choosing plants and materials with a variety of surfaces make your backyard far more interesting. You can easily create contrasts by mixing plants with large and small leaves or using a rough grass around delicate plants. 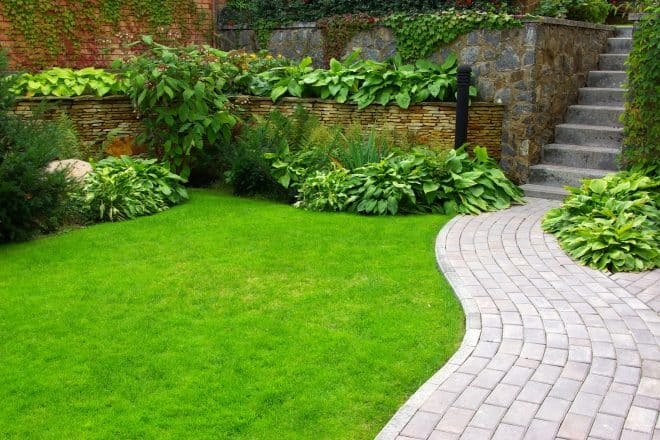 You can even surround lush grass, with a smooth, light-coloured paver. Flower beds and paths are the easiest way to create design elements in your backyard. They create order and precision within your yard. By edging your paths and garden beds, you also reduce your maintenance needs by preventing weeds from creeping out of beds, while also preventing rocks and other materials from being kicked into beds. Every landscape design needs a centrepiece. Whether it’s a pool, deck, pergola or courtyard, a centrepiece draws the eye and gives you something to organise the rest of the design around. Whatever your centrepiece is, it needs to be eye-catching, and it needs to be perfectly designed. You’ll be amazed by how quickly the rest of the design flows once you have created this organising principle. External lighting should never be left out of landscape design. Remember, you’re creating a living space, and you want it to be usable for as many hours of the day as possible. Lighting not only increases usage time, it works as a design element. You can use it to highlight your centrepiece, and the surrounding features, meaning you enjoy a completely different garden at night. Keeping your garden alive can be difficult. There is an art to watering, and it can be challenging to master. When creating your design and budget, try and find room for an irrigation system. These systems are automated and designed to provide the right amount of water at the right time, and you don’t have to do a thing. Of course, this isn’t a binding rule but rather a suggestion. If you love roses, hydrangeas, lilies and other non-native species then go for it. But, if you’re happy to think outside the box and look in our own backyard, you’ll be rewarded. Native plants are easier to care for because guess what – they have evolved over millennia to survive this climate. You won’t need to water them as much, you won’t need to doctor your soil, and you won’t need to tear your hair out when you see your roses shrivel up and die year after year. Of course, these 7 tips are just a beginning. If you want the type of advice that takes you from design all the way to completion, get in touch with the team at Everlast Services. We’re always happy to have a chat and discuss your needs.